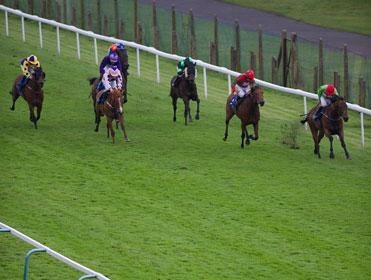 Timeform Radio Racing Tips: La Fortunata to shine? Has David found a winner or two? Some interesting racing at this afternoon's three meetings, with a bit of variety sprinkled in among the usual mid-week bread-and-butter handicaps. The feature sprint at Leicester at 15:20 looks a trappy affair, with the likely market leaders Amour Propre and Temple Meads having to prove their well being. It might be worth chancing Ballista and La Fortunata against them. Ballista has been rejuvenated since winning a seller in the spring and was better than ever at Chester last time, while La Fortunata has also improved this year. Her effort at Pontefract last time looks all the stronger after the winner Mince followed up at York at the weekend. Worcester's jumps card opens with two divisions of a 'hands-and-heels' chase. The second, at 14:40, looks particularly weak and even though he's the likely favourite Chandlers Cross has much more going for him than the motley bunch against him. With solid recent form to his name, he'll take all the beating.